East meets West! 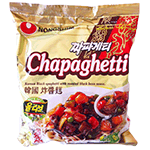 Be amazed by the fusion cuisine with the introduction of Nong Shim's Chapagetti. Our chef brings you this distinctive combination of western pasta with the taste of the East. We use only the finest mix of ingredients and spices, blending spaghetti-like noodles with our secret Chajang sauce, chunky dehydrated carrots, onions, and ground beans. Product of Korea.